An employee of the museum at a former Nazi German death camp in Poland has been charged with anti-Semitism along with five other men, local media and police said Saturday, according to AFP. Officers detained the Poles in the eastern city of Lublin on Thursday and charged them with incitement to hatred, after three of them were caught putting up posters at bus stops reading “Zionists Leave Lublin”, police said in a statement quoted by the news agency. They identified one of the men as 50-year-old Krzysztof K. — omitting his last name because of privacy laws — who according to local media worked as a graphic designer at the museum at the former Majdanek camp. He had allegedly worked there for over two decades and printed some of the anti-Semitic posters on office equipment, reported AFP. “We’re shocked by these revelations,” museum spokeswoman Agnieszka Kowalczyk-Nowak said, quoted by the Polish news channel TVN. “We’ve launched an internal investigation at the museum. Management has decided to suspend him from duty while the case is being clarified,” she added. Police said the group, who also included a local businessman and several unemployed individuals, had been putting up anti-Semitic posters around town since 2010. They face up to seven and a half years in prison. Nazi Germany set up the Majdanek camp on the outskirts of Lublin in 1941 and ran it until 1944. The museum estimates that 80,000 prisoners, including 60,000 Jews, died there, around half of those who passed through the camp. 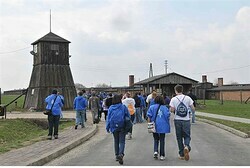 In October, two Turkish university students were arrested at Majdanek, after giving Nazi salutes to a group of Israeli students and shouting “Heil Hitler”. The two were arrested after members of the Israeli group filed charges and were detained on charges of promoting fascist propaganda. In a similar incident two months later, two Turkish history students were arrested after giving the Nazi salute at the former Auschwitz death camp and taking pictures of one another doing so. The students avoided jail, however, after they admitted guilt, which allowed the Oswiecim court to sentence them without a trial. The court gave the two a six-month suspended jail term, fined them and confiscated the phone they used to snap the photos. Likud MKs Haskel and Glick to attend Trump inauguration Likud MKs Sharren Haskel and Yehuda Glick may be first Israeli lawmakers ever to attend US Presidential inauguration.